Route Sales Associate travels or moves from one place to another for selling and delivering the product and services of the company. The major responsibilities that form part of the Route Sales Associate Resume are – providing service or selling products at customer’s destination, building and maintaining rapport with customers, loading and unloading products, managing inventory, utilizing POS materials for driving sales, meeting sales goals, ensuring delivery on time, generating new leads, keeping track of pricing policies of self company and competitors, and executing all tasks as assigned. 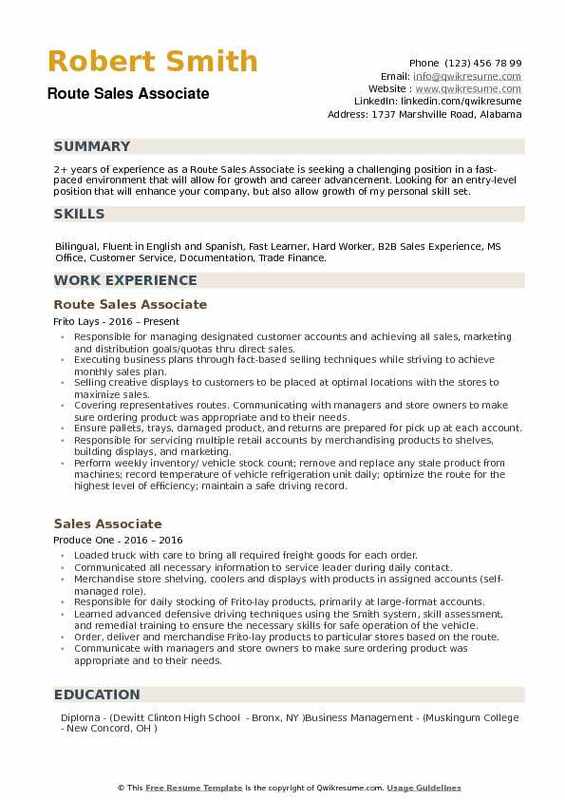 The Route Sales Associate’s are supposed to depict related qualifications in their resumes such as – a very good driving skill, knowledge of product pricing, road safety knowledge, ability to operate handheld electronic devices for processing orders, and physical abilities to lift or move heavy goods. Formal education is not mandatory, but most of these associates have a high school diploma with a valid driving license. Objective : 4+ years of experience as a Route Sales Associate is looking forward to putting my skills, experience, and abilities to grow professionally and contribute to the goals of the company. Skills : Responsible and Hardworking, Effective Management Of Situations Or Problems, Ability To Multitask, Work Under Pressure, Ability to Follow Instructions, Versatile and Good Teamwork, Organized And Dedicated, Positive Attitude Skill, Oral And Written English, Microsoft Office, Ability to Work with the Public. Under general supervision, developing account sales and delivering products to various stores (i. e. Grocery, convenience, schools, gas stations, etc.) within the designated route area. Driving delivery truck in and out of the distribution center, the type of truck will vary by route and zone needs. Performing inventory for product cases in truck, loading and unloading products to and from the truck and delivering product cases to customer locations, may use a 2-wheel dolly or other rolling product equipment. Displaying product on display racks in customer accounts. May create signs and displays for the product. Ensuring target goals are maintained for sales, waste, and safety, maintains daily paperwork and cash flow integrity. Directly impacts the sales process having continuous contact with customers, decision-making is extensive, which is governed by policy and guided by procedure while focused on daily operations. Headline : Over 6+ years of experience as a Route Sales Associate is currently seeking opportunity within a new organization, with similar pay and good benefits due to recent changes within my current employer. Skills : Microsoft Excel, Cash Handling, Transportation, Customer Service, Route Sales, Warehouse Logistics, Inventory Control. Drive company route truck safely and use equipment properly to load and/or unload the truck. Merchandise store shelving, coolers and displays with products in assigned accounts (self-managed role). Writing orders by computer, collecting money, and obtaining signatures on receipts. Responsible for daily stocking of Frito-lay products, primarily at large-format accounts. Use a handheld computer to record sales, manage inventory and communicate daily. Distribute Frito-lays complete line of quality products to existing and new accounts. Order, deliver and merchandise frito-lay products to particular stores based on the route. With a focus on meeting customer service and making sure our products remain fresh and look good in the stores. 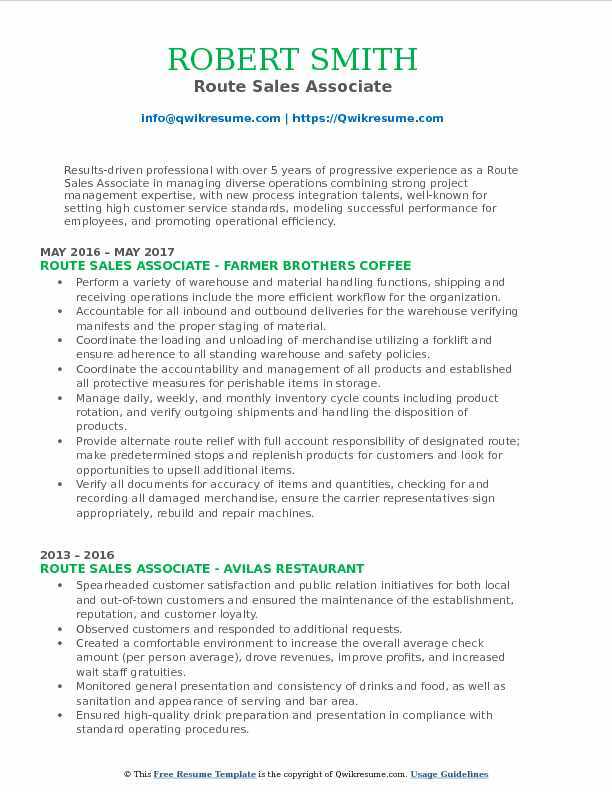 Summary : 8+ years of experience as a Route Sales Associate is seeking to continue my career with an organization that will utilize my educational background along with my sales, management, and supervision skills to benefit mutual growth and success. 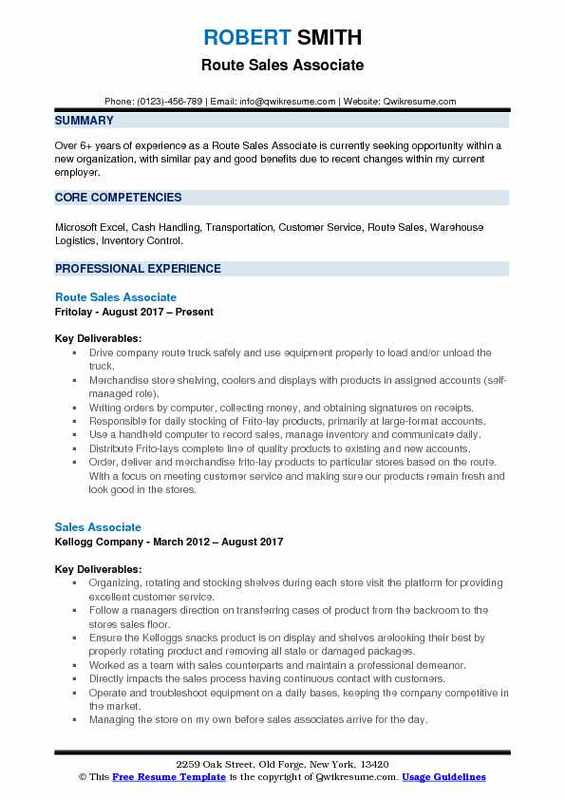 Skills : Customer Service Experience, Excel, Microsoft Access, Customer Service, Retail Sales, Inventory Operations, Workflow, Mac, Route Sales. Directly impact the sales process by having continuous contact with customers. Collaborating with internal and external customers to exceed established objectives. Gathering information for management to convert accounts a to new process or expand existing accounts. Informing management and director of issues, as well as suggestions, implement a streamlined process. Developing account sales and deliver product to various stores on the designated route area. Loading and unloading products to and from the truck and delivering product cases to customer locations. Merchandising products according to the company and clients schematics. Operating and troubleshooting equipment on a daily bases, keeping the company competitive in the market. Objective : A Route Sales Associate with 3+ years of experience is looking to obtain a challenging position within a professional environment providing an opportunity for growth and career advancement based upon personal initiative, motivation, and job performance. 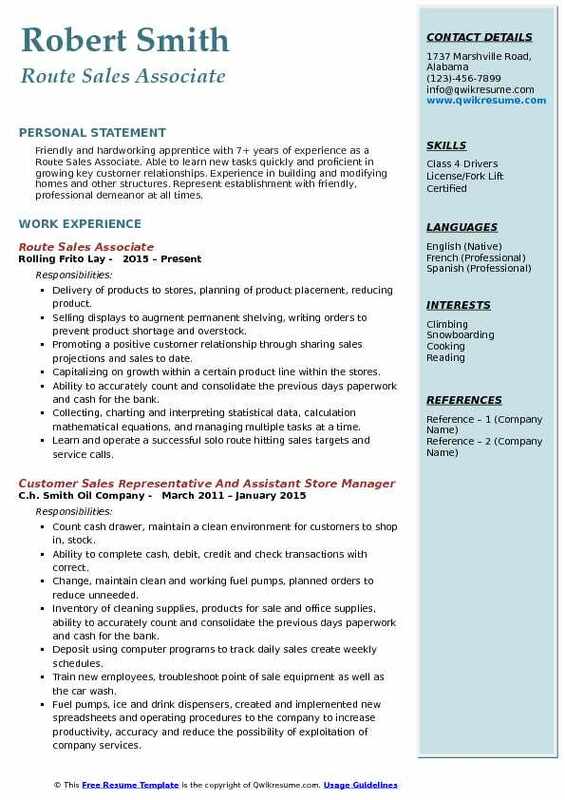 Skills : Customer Service, Inventory Management, Basic Computer, Communication, Clean Driving Record, Chauffeurs License. Loading, delivery, and sale of products to new and existing customers. Assurance of proper procedure in writing order and merchandising product. Performing inventory for product cases in truck, loading and unloading products to and from the truck and delivering product cases to customer locations, may use a 2 wheel dolly or other rolling product equipment. Ensuring target goals are maintained for sales, waste, and safety. Merchandise by using pos materials, correct product placement, and continuous relationship with store personnel and management. May be required to reset and relocate products using proper tools and materials. Managing the displays to keep the customers in stock and minimize out of date product. Responsible for attending sales meetings and conference calls and participating in any efforts beyond standard working hours to help achieve company goals. 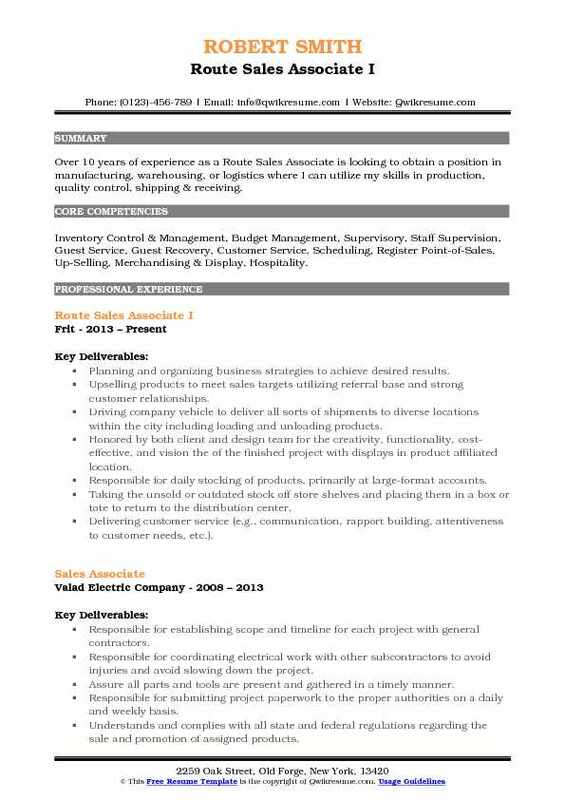 Summary : Friendly and hardworking apprentice with 7+ years of experience as a Route Sales Associate. Able to learn new tasks quickly and proficient in growing key customer relationships. Experience in building and modifying homes and other structures. Represent establishment with friendly, professional demeanor at all times. Delivery of products to stores, planning of product placement, reducing product. Selling displays to augment permanent shelving, writing orders to prevent product shortage and overstock. Promoting a positive customer relationship through sharing sales projections and sales to date. Capitalizing on growth within a certain product line within the stores. Ability to accurately count and consolidate the previous days' paperwork and cash for the bank. Collecting, charting and interpreting statistical data, calculation mathematical equations, and managing multiple tasks at a time. Learn and operate a successful solo route hitting sales targets and service calls. Continuously maximized sales and managed freshness, variety, and availability of store inventories. Objective : Meticulous and an objective-oriented individual with 3+ years of experience as Route Sales Associate is able to contribute high-quality output individually and as a team player. Proven ability to adapt to various environments, always willing to learn with the ability to work with professionals on all levels. 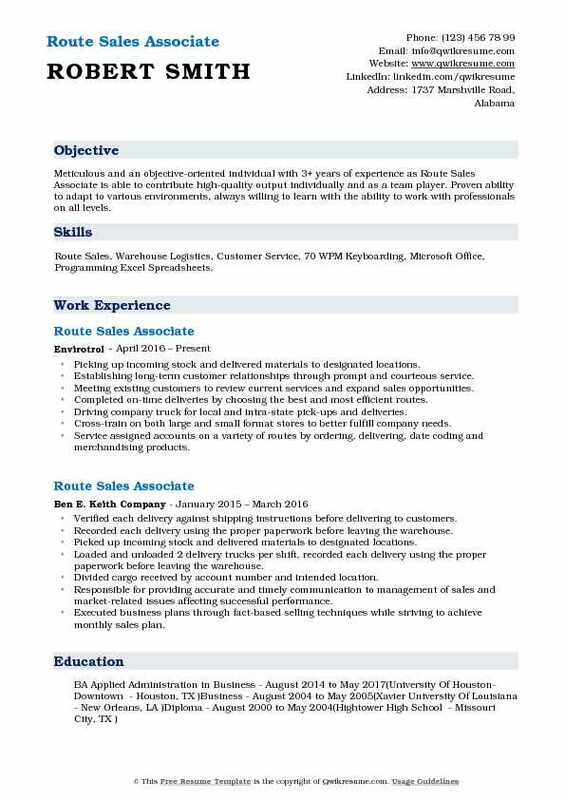 Skills : Route Sales, Warehouse Logistics, Customer Service, 70 WPM Keyboarding, Microsoft Office, Programming Excel Spreadsheets. Picking up incoming stock and delivered materials to designated locations. Establishing long-term customer relationships through prompt and courteous service. Driving company truck for local and intra-state pick-ups and deliveries. Cross-train on both large and small format stores to better fulfill company needs. Service assigned accounts on a variety of routes by ordering, delivering, date coding and merchandising products. Maintains product displays, monitors product codes and ensures retail price tags are properly displayed. 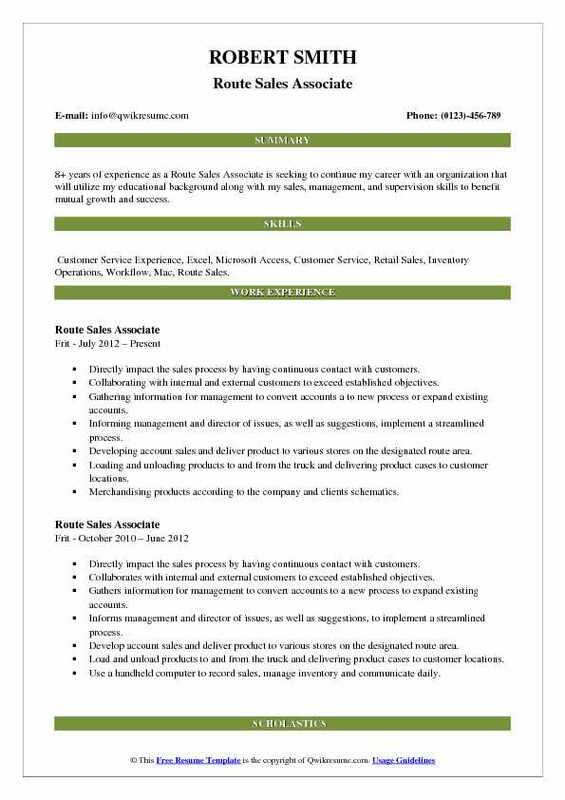 Headline : Results-driven professional with over 5 years of progressive experience as a Route Sales Associate in managing diverse operations combining strong project management expertise, with new process integration talents, well-known for setting high customer service standards, modeling successful performance for employees, and promoting operational efficiency. Skills : Inventory, Operations, Operations Management, Workflow, Cash, Operations Management Staff Leadership, Development Account Acquisition Projected Costs, Forecasting Shrinkage, Auditing Cash. Perform a variety of warehouse and material handling functions, shipping and receiving operations include the more efficient workflow for the organization. Accountable for all inbound and outbound deliveries for the warehouse verifying manifests and the proper staging of material. Coordinate the loading and unloading of merchandise utilizing a forklift and ensure adherence to all standing warehouse and safety policies. Coordinate the accountability and management of all products and established all protective measures for perishable items in storage. Manage daily, weekly, and monthly inventory cycle counts including product rotation, and verify outgoing shipments and handling the disposition of products. Provide alternate route relief with full account responsibility of designated route; make predetermined stops and replenish products for customers and look for opportunities to upsell additional items. Verify all documents for accuracy of items and quantities, checking for and recording all damaged merchandise, ensure the carrier representatives sign appropriately, rebuild and repair machines. 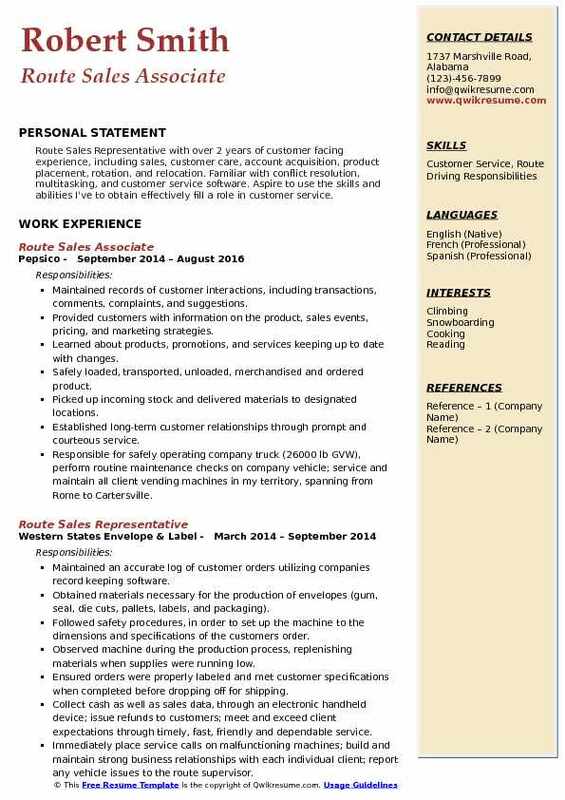 Summary : Over 10 years of experience as a Route Sales Associate is looking to obtain a position in manufacturing, warehousing, or logistics where I can utilize my skills in production, quality control, shipping & receiving. Skills : Inventory Control & Management, Budget Management, Supervisory, Staff Supervision, Guest Service, Guest Recovery, Customer Service, Scheduling, Register Point-of-Sales, Up-Selling, Merchandising & Display, Hospitality. Planning and organizing business strategies to achieve desired results. Upselling products to meet sales targets utilizing referral base and strong customer relationships. Driving company vehicle to deliver all sorts of shipments to diverse locations within the city including loading and unloading products. Honored by both client and design team for the creativity, functionality, cost-effective, and vision the of the finished project with displays in product affiliated location. Responsible for daily stocking of products, primarily at large-format accounts. Taking the unsold or outdated stock off store shelves and placing them in a box or tote to return to the distribution center. Delivering customer service (e.g., communication, rapport building, attentiveness to customer needs, etc.). Responsible for managing and maintaining product inventory being used for daily route sales. 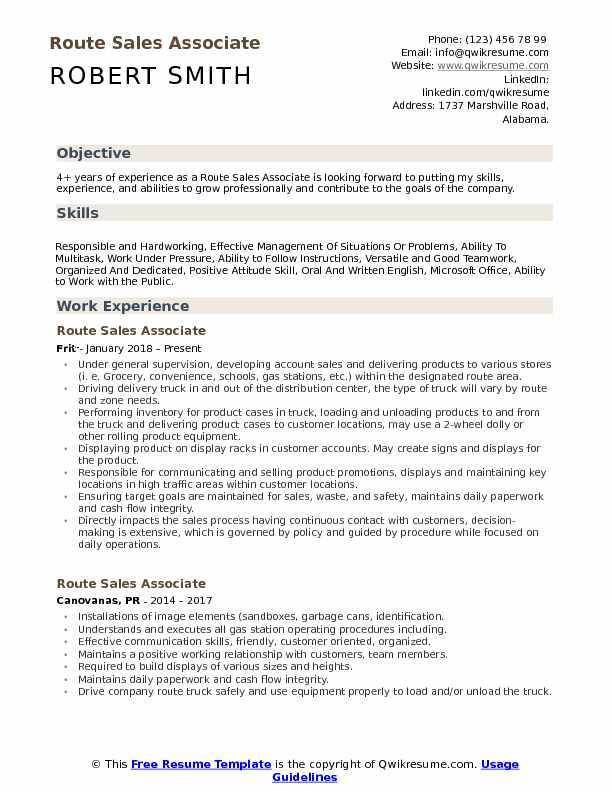 Objective : Route Sales Representative with over 2 years of customer facing experience, including sales, customer care, account acquisition, product placement, rotation, and relocation. Familiar with conflict resolution, multitasking, and customer service software. Aspire to use the skills and abilities I've to obtain effectively fill a role in customer service. Maintained records of customer interactions, including transactions, comments, complaints, and suggestions. Provided customers with information on the product, sales events, pricing, and marketing strategies. Learned about products, promotions, and services keeping up to date with changes. Safely loaded, transported, unloaded, merchandised and ordered product. Responsible for safely operating company truck (26000 lb GVW), perform routine maintenance checks on company vehicle; service and maintain all client vending machines in my territory, spanning from Rome to Cartersville. Quickly resolve any and all customer concerns or complaints; ensure proper stock and merchandise availability, depending on the specific needs of each customer. Objective : 2+ years of experience as a Route Sales Associate is seeking a challenging position in a fast-paced environment that will allow for growth and career advancement. Looking for an entry-level position that will enhance your company, but also allow growth of my personal skill set. Skills : Bilingual, Fluent in English and Spanish, Fast Learner, Hard Worker, B2B Sales Experience, MS Office, Customer Service, Documentation, Trade Finance. Responsible for managing designated customer accounts and achieving all sales, marketing and distribution goals/quotas thru direct sales. Executing business plans through fact-based selling techniques while striving to achieve monthly sales plan. Selling creative displays to customers to be placed at optimal locations with the stores to maximize sales. Covering representatives routes. Communicating with managers and store owners to make sure ordering product was appropriate and to their needs. Ensure pallets, trays, damaged product, and returns are prepared for pick up at each account. 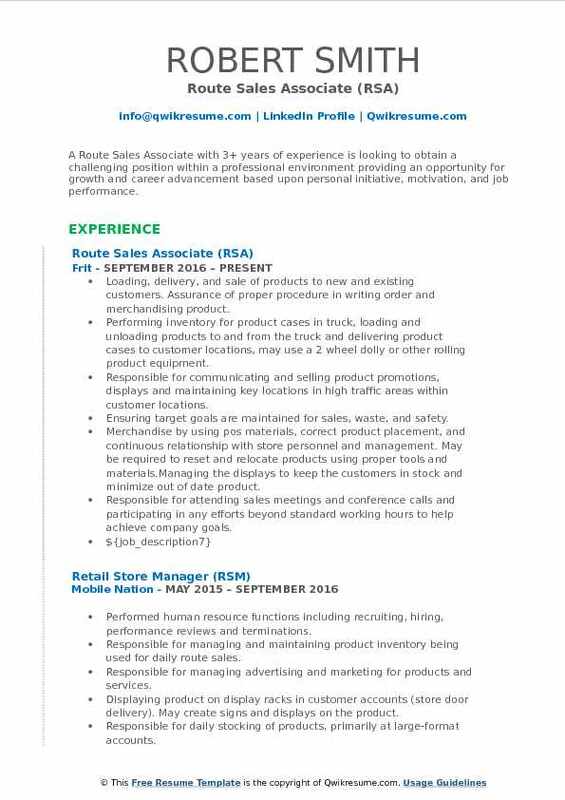 Responsible for servicing multiple retail accounts by merchandising products to shelves, building displays, and marketing. Perform weekly inventory/ vehicle stock count; remove and replace any stale product from machines; record temperature of vehicle refrigeration unit daily; optimize the route for the highest level of efficiency; maintain a safe driving record.